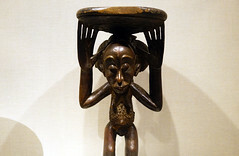 Political institutions in Africa that predate European colonization have ranged from large, centralized kingdoms led by a single ruler to smaller, village-based societies. Centralized states may vary in size and complexity but are generally ruled by a chief or king, supported by a hierarchical bureaucracy. In many different societies, leaders are considered to be semi-divine. In less centralized societies, power is not vested in a single individual. Instead, authority may be exercised by family heads, a council of elders, or local social or political institutions. African political institutions were dramatically impacted by colonial rule. The role of traditional rulers continues to change in post-independence Africa, where modern states are governed by national leaders. In centralized states, leaders have historically played an important role as patrons of the arts. Often, leaders held monopolies over the materials used and controlled artistic production as well (see image above). They commissioned a wide range of prestige objects, distinguished by the lavish use of luxury materials (see below), as well as complex architectural programs (example here). Works made of metal, ivory, or beads were not only visually spectacular, but also reminded the public of the king’s wealth and power. Such art forms underscored the king’s fundamental difference from—and superiority to—his subjects. Royal arts are often used in ceremonial contexts that mark and legitimize political authority. Handheld objects, such as flywhisks, staffs (like the one below), and pipes, are used as personal regalia to indicate rank and position within the court. 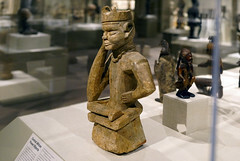 Special seats of office and clothes and regalia made of expensive materials (example here) distinguish the leader’s exalted position and set him apart, both literally and figuratively, from his subjects. Larger works legitimize political power to a broad public. Portraits of past leaders document dynastic lines of leadership and serve as a visual reminder of the present king’s legacy like the portrait of an Oba above). Such portraits generally present an idealized depiction of a youthful and vigorous king and emphasize the various trappings of royalty. 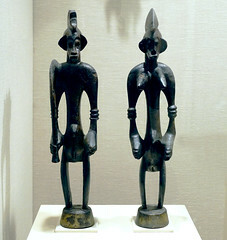 Among smaller, village-based societies, in which governance is distributed among local associations, artworks do not glorify a particular leader. Instead of lavish displays of royal regalia, masks and figures are used as agents of social control or education. Such works are generally commissioned by a group of individuals, such as a council of elders or members of a religious association. They give visual form to spiritual forces whose power is enlisted to maintain order and well-being in a community. Sometimes, artworks are deliberately fearsome, employing elements of the natural world considered inherently powerful, such as sacrificial blood or medicinal plants (example above). 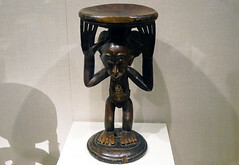 In other contexts, the sculpture’s imagery presents cultural ideals held collectively by the society (example here). Cite this page as: Dr. Christa Clarke, "Art and politics," in Smarthistory, October 28, 2016, accessed April 19, 2019, https://smarthistory.org/art-and-politics/.